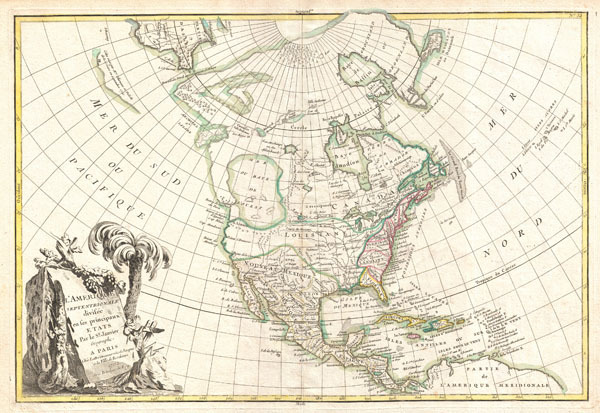 An altogether fascinating map of North America by Jean Janvier dated 1762. Covers the continent from Panama to the Arctic Circle, extends westward to include parts of Asia and eastward as far as Iceland. This map, which is heavily influenced by the theoretical mappings of Guillaume de l'Isle and Philippe Buache, went through several states of which this is the first and possibly the most interesting. Javier divides the continent according to the three colonial powers that controlled it, with England controlling the colonies along the east coast, France occupying Canada and Louisiana, and Spain dominating Mexico, Florida, Cuba and Central America. By far the most interesting aspects of this map deal with Janvier's treatment of the largely unexplored Pacific Northwest. A magnificent sea, called the Sea of the West or in this case the 'Baye de L'Ouest,' occupies the greater part of the northwestern part of the continent. This body of water, alternatively called the Sea of the West or Mer de l'Ouest, was speculated by Philippe Buache and Guillaume De l'Isle in the early 18th century based upon wishful thinking, American Indian stories, and the somewhat questionable 16th century explorations of Juan de Fuca. Janvier gives the Mer de l'Ouest its fullest expression, though he specifically does not connect it to either the network of lakes and rivers extending westward form the Hudson Bay or to the similar network extending westward from Lake Superior. These river and lake networks were being actively explored throughout the early 18th century by a number of little known but important French explorers. Most specifically the explorations of Verenrye with regard to the discovery of the Lake of the Woods (L. Des Bois) and Lake Winnipeg (L. Ouinipigon), both of which appear on this map. Even farther to the north we find the Strait of Ainan narrowly separating American from Asia. The extreme northeast tip of Asia is itself fairly well mapped giving evidence to the explorations of Vitus Bering and Tschirikow. Slightly to the south of Asia the cartography is slightly less certain with regard to a questionable landmass in the north Pacific. This mass most likely stems from Tschirikow sightings of the Aleutian Islands and the assumption by Muller and others that they may have been a single land mass. On the opposite side of the map, Janvier places the Great Lakes firmly within French territory, a clear case of carto-advocacy. The English colonies, outlined in red are only vaguely accurate with regard to their borders with Pennsylvania and New Jersey extending north to the Canadian border. The lower left hand quadrant is dominated by a large decorative title cartouche depicting some of the flora of the continent. Though most examples of this map are dated 1762, the map itself appeared in multiple states between its first edition in 1762 and final iteration in the late 1780s. We have identified at least three variants. The first edition, 1762, includes a large 'Sea of the West,' a series of lakes and rivers associated with the legendary voyages of Admiral de Fonte, and the Aleutians rendered as a single landmass, a la Muller. A second variant, possibly 1775, includes the De Fonte speculation, and the 'Lake of the West,' but renderers the Aleutians embryonically as a series of islands. Another third state, possibly from 1783, retains the 'Sea of the West,' but does not include the De Fonte discoveries further north, and the Aleutians are embryonically rendered as individual islands. There may be still other variations we have yet to discover. A full series of these beautifully produced maps presents a thorough overview of the conceptual development of the American northwest prior to Cook. Drawn by Jean Janvier in 1762 for issue as plate no. 32 in Jean Lattre's 1775 issue of the Atlas Moderne. Phillips (Atlases) 629-33. Wagner, H. R., The Cartography of the Northwest Coast of America to the Year 1800, 559. Wheat, C. I., Mapping of the Transmississippi West, 1540 - 1861, 192. Sellers, J. R. and Van Ee, P. M., Maps and Charts of North America and the West Indies 1570-1789, 93.